We always ask ourselves what you as our client really want. How can we make the final configuration work better for you? Is it practical and cost effective? How can we make the layout more welcoming? How can we make the process more pleasurable and less problematic? Do you want the latest and the greatest or would you be happy with the traditional design? Being focused on your needs we see our primary task as a critique of your thinking and thus establishing a partnership between us. We then apply our knowledge of the possible and practical and arrive at the design along with the practical solutions to achieve the best design that best suits you. We design Kitchens, Bathrooms, Storage/Entertainment Units to suit your lifestyle, employing well known proven concepts. The kitchen is the hub of your home and is now a real focal point with the appearance of furniture but to serve as a very practical area. Having been in business now for 29 years we know we are competitive especially when clients take into account all the services we provide, we have a proven track record with many testimonials available. 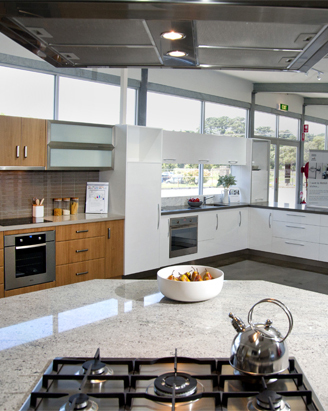 "Past Winner & Twice Runner Up in the Victorian Kitchen of the Year Awards"